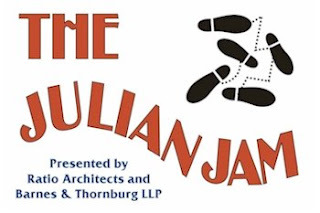 For the ninth consecutive year, The Julian Center is hosting The Julian Jam presented by Ratio Architects, Inc. and Barnes & Thornburg, LLP. The Julian Jam is a Big Band evening filled with live music by The Stardusters, swing dancing, hors d'oeuvres, drinks, silent auction, and chances to win fun gifts. Naptown Stomp Lindy Hop Society will be on hand to provide short lessons and swing time fun! The proceeds from this event will help underwrite the children’s programming at The Julian Center and in particular, the onsite therapy program for child victims of domestic abuse and sexual assault. COST: Individual tickets are available for $20. You may order your tickets online by clicking here or over the phone by calling Molly Barrick at 317.941.2220. MasterCard, Visa, and American Express are accepted. Table sponsorships are also available. For more information, click here. You may also contact Pamela Testa at 317.941.2215.